On November 21, 2004 New Jersey K-12 Grade Championship was held in Lincroft, NJ. More than 300 players participated in 13 sections. Many our students participated in these championships, and they showed very high results. 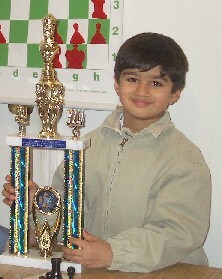 - Vaed Khurjekar received 2nd place trophy in Kindergarten section. He won 4 games of 5! 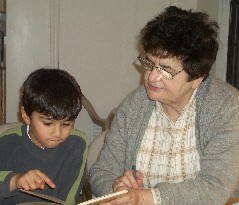 Vaed started our chess classes in April from the very beginning. His progress is very impressive. - Another our student Roman Rychkov also participated in this section and finished with 50% result - 2.5 of 5. Dina Shimanovich again showed high result and won trophy - this year for the 3rd place among 3rd-grade students. Dina won 4 games of 5! This great result - 4 victories in 5 games - was achieved also by our another student Pranay Nadella; unfortunately, by additional coeffients he got only 7th place. The third our student participated in this section, Ksenya Rychkova had also a good result - she won 3 games of 5. - In the section of 7th grade students, Kostya Mazur was awarded with 2nd place trophy. Another our student in this section Alex Rizman won 4th place trophy. - Esther Shimanovich won 3 games of 5 in 4th-graders competition. - Dmitry Khrabrov played in 6th-graders section and got 3 points in 5 games. - Akash Khanolkar also participated for the first time in New Jersey K-12 championship, and finished with good 50%-result - 2.5 points in five games in 5th-graders section. In December 10-12, 2003 our student Yuvik Umapathy participated in 2004 National K-12/Collegiate Championship in Lake Buena Vista, Florida. Yuvik participated for the first time in the tournament of all-national rank. 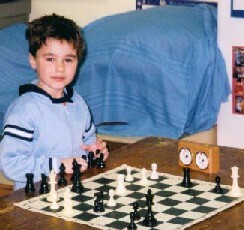 Before that, he successfully played in different NJ tournaments, including 2004 NJ K-12 Championship (1st-graders section). 97 players participated in 1st-graders section of National championship in Florida - 75 with USCF rating and 22 unrated players. 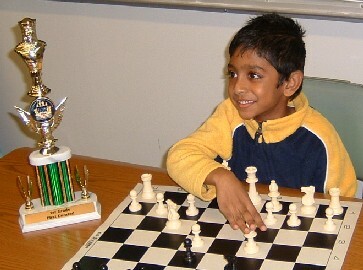 In 7 games Yuvik Umapathy got 4.5 points and won the 1st place trophy among unrated 1st-graders. We congratulate Yuvik with this high result and wish him new chess achievements!